Just a note- We are open all weekend but our Sunday hours will be changing back to Noon-4:00 starting next Sunday. Save the Date- We've Got Your Back Sale! Plan now to take advantage of our super sale! 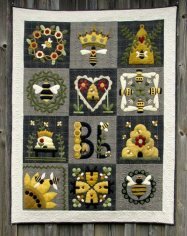 Bring in your completed quilt tops and get 30% off your backing! Sale dates are October 8th, 9th, & 10th. 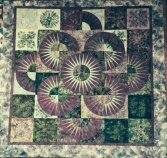 This sale is limited to in store only, and you must bring in your quilt tops to receive the discount. See you soon! Calling all Griz fans! 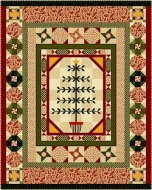 Hoffman Fabrics has designed custom fabric that will be available in Dec/Jan. We are taking pre-orders on this fabric, so call 406-677-2730 to place your order and guarantee you get some of this beautiful fabric! Pre-Order deadline is September 10th. Our classroom is always open for groups to use. Just call ahead to check if it is in use. We are also happy to schedule a class for a group upon request! Who can resist this whimsical Santa?? 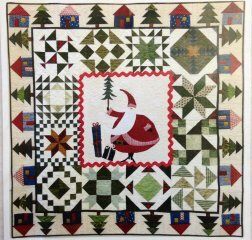 We have made Santa's Village by ThimbleCreek Quilts into a 12 month block of the month. Join us each 2nd Saturday of the month or call and we can send blocks to you. We have just a few kits left! Bring any project that Toni has taught and she will guide you through finishing it up! Haven't taken a class from Toni yet...not a problem! She will help you get started with any of her innovative foundation piecing method patterns! Call ahead so she can have the material on hand otherwise no sign up needed--just show up between 10am & 2pm and Toni will be on hand. 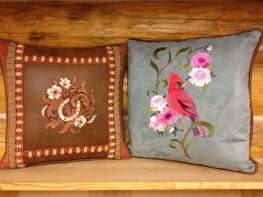 Katie made these gorgeous pillows first by embroidering on suede, adding trim, ruffles, piping, and finishing with a zipper closure! Whether you want to use suede, home dec fabric, or quilted fabric, Katie will show you how to get a very professional look for your pillow. 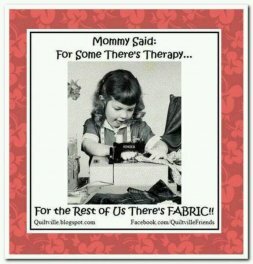 There will be some advanced preparation so you can be ready to sew on class day. Our BOM's are mailed out the first week of each month. Call to get your name on a list!